Our regularly updated newsletter provides timely articles to help you achieve your financial goals. Please come back and visit often. FBAR is not a tax form, but is due to the Treasury Department by April 15, 2019, but may be extended to October 15. Form 114 must be filed electronically through the BSA E-Filing System website. The BSA E-Filing System supports electronic filing of Bank Secrecy Act (BSA) forms (either individually or in batches) through a FinCEN secure network. 1. Report Worldwide Income. By law, Americans living abroad, as well as many non-U.S. citizens, must file a U.S. income tax return and report any worldwide income. Some key tax benefits, such as the foreign earned income exclusion, are only available to those who file U.S. returns. Any income received, or deductible expenses paid in foreign currency must be reported on a U.S. tax return in U.S. dollars. Likewise, any tax payments must be made in U.S. dollars. Both FinCen Form 114 and IRS Form 8938, require the use of a December 31 exchange rate for all transactions, regardless of the actual exchange rate on the date of the transaction. Generally, the IRS accepts any posted exchange rate that is used consistently. FBAR. Taxpayers do not file the FBAR with individual, business, trust or estate tax returns. Instead, taxpayers with foreign accounts whose aggregate value exceeded $10,000 at any time during 2018 (or in 2019 for next year's filing returns) must file a Treasury Department FinCEN Form 114 (formerly TD F 90-22.1), Report of Foreign Bank and Financial Accounts ("FBAR"). The deadline for filing the FBAR is the same as for a federal income tax return and must be filed electronically with the Financial Crimes Enforcement Network (FinCEN) by April 15, 2019. FinCEN grants filers missing the April 15 deadline an automatic extension until October 15, 2019, to file the FBAR. Taxpayers who want to paper-file their FBAR must call the Financial Crimes Enforcement Network's Regulatory Helpline to request an exemption from e-filing. Scammers may know the last four digits of the taxpayerâs Social Security number. Last month, we showed you how to start building a foundation for tracking jobs in QuickBooks. We explained that you can use the software's jobs tools to track income and expenses for any related group of items and/or services (you can think of them as projects, if you prefer). Determining whether you'll need to create a new account in your Chart of Accounts for your job income and expenses. You should consult with a QuickBooks professional anytime you think it might be necessary to modify the Chart of Accounts. Now that you've recorded the items and jobs themselves, you can start using them in transactions, and eventually track your progress by generating reports. Figure 1: You can enter individual, billable activities and assign them to jobs. In the example above, you are limited to recording one day's work on a specific SERVICE ITEM. You would verify the date and select from the drop-down lists to complete the fields for employee NAME, CUSTOMER:JOB, and SERVICE ITEM. You can either use the timer to time the job or enter the number of hours manually in the DURATION box. Click in the Billable box to create a checkmark and add NOTES if you would like. The CLASS field is optional; talk to us if you're not familiar with this feature. If you worked on two separate service items on the same day for that CUSTOMER:JOB, you would create two individual records. 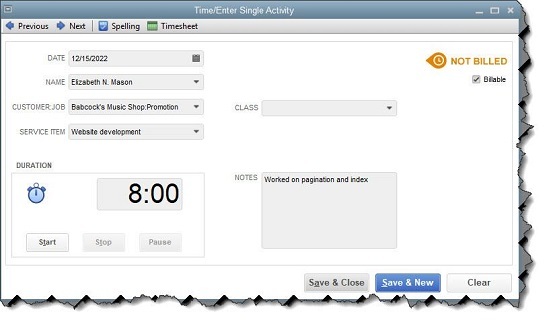 You can also enter billable activities directly on a timesheet by clicking Employees | Enter Time | Use Weekly Timesheet. Once you select the employee NAME at the top, any single activity(ies) you created that week will appear as individual records, and vice versa. Writing a check or using a credit card for a job-related purchase that should be billed to the customer? You would fill out these forms in QuickBooks like you usually do, making sure that you document the items or services by highlighting the Items tab, select the correct CUSTOMER:JOB, and make a checkmark in the BILLABLE? column. Figure 2: If you write a check or charge your credit card for purchases that can be billed to a CUSTOMER:JOB, be sure to record it in QuickBooks. If you will be doing some billable driving for your job, you should also be tracking your mileage in QuickBooks. Open the Company menu and select Enter Vehicle Mileage. If you haven't created a VEHICLE record in QuickBooks, click and easily do so. Complete the rest of the fields and save. Tip: Do you want to see some of your overhead expenses on job costing reports? Create a CUSTOMER:JOB named "Overhead" and assign related costs to it. Figure 3: When you create an invoice for a CUSTOMER:JOB who has billable time, mileage, or other expenses, QuickBooks can automatically add them. If you leave the first option checked and click OK, another window will open that lists all of the expenses you've marked as billable to the customer, arranged by type. Click in the first column of each expense you want to include and click OK. Your invoice containing those entries will open. Do any editing necessary, and then save it. Note: You'll probably notice two fields in the Choose Billable Time and Costs window that refer to Markup. This is an advanced concept that we can explore with you, should you want to charge customers more for expenses you've incurred on their behalf. QuickBooks contains a wide variety of reports related to your work billing customers for jobs. Click Reports in the navigation pane or Windows menu, then Jobs, Time & Mileage to see what's available. Choose a date range and click Run to see them appear with your own data. If you've never worked with jobs in QuickBooks, we strongly recommend that you let us help you here. There are a lot of moving parts, and you don't want to miss out on any of your efforts or expenses that are billable. Individuals - File an income tax return for 2018 and pay any tax due. If you want an automatic 6-month extension of time to file the return, file Form 4868, Application for Automatic Extension of Time To File U.S. Individual Income Tax Return or you can get an extension by phone if you pay part or all of your estimate of income tax due with a credit card. Then file Form 1040 by October 15.